Why Did Israel Netanyahu Travel to Oman? The visit of Israeli prime minister Benjamin Netanyahu to Oman briefly captured the imagination and the emotions of many. Was this a sign of some shift in the political environment that could lead to progress on a few of the region’s multiple crises? Could it signal an Israeli willingness to work with Oman on reducing tension with Iran, a role that Oman has played with others of Iran’s adversaries, including the United States, over the years? At closer glance, a more modest interpretation of the event is warranted. It’s useful to consider more carefully what the visit means in the context of Israeli foreign policy and of Omani foreign policy, before assessing its larger regional implications. For Israel, contact with Arab states has long been a foreign-policy objective. Peace treaties with Egypt (1979) and Jordan (1994) were major achievements, but did not lead to a larger normalization of relations in the region. Arab peace initiatives to address the Palestinian issue have gradually acknowledged Israel’s existence, short of formal diplomatic recognition, but have not led to open political engagement on a bilateral basis. Major Arab states beyond Egypt and Jordan simply did not see the need or the benefit of such ties, and most believed that formal recognition should be conferred only in the context of Israeli concessions to the Palestinians. But contact has happened, in many places and ways. Relations with Morocco and Tunisia are one model, where some tourist and commercial activities with Israel have been permitted. Former leaders King Hassan II of Morocco and Habib Bourguiba of Tunisia openly supported peace processes. More recently in the Gulf, shared concerns between Israel and many of the GCC countries over security issues, from terrorism to the Iran threat, has led to discreet cooperation. Often, it’s in multilateral forums that contact is becoming normalized. Oman was the pioneer, over 20 years ago, agreeing to host the Water Working Group as part of the Oslo process. Israeli desalination experts were frequent visitors to Oman in that context, and were able to contribute significantly to that research program. That program is still functioning in Muscat, the only surviving component of the multilateral working groups from the mid-1990s. The UAE has also kept that spirit alive, including Israeli delegations when it hosts global forums on renewable energy, for example, or, most recently, the Judo Grand Slam competition, where the Israeli national anthem was played and an Israeli minister was present. For Oman, a small and poor but strategically located state, a quietly independent foreign policy has been its hallmark. Like Morocco and Tunisia, the decision to pursue a non-traditional approach to regional relations comes from the top. Sultan Qaboos, on the throne for nearly 50 years, has established a distinct role for himself and his country. Oman has been a quiet venue for multiple diplomatic endeavors, from early explorations between enemy states, to acute interventions to end hostage crises, to trusted venue for ongoing contacts between parties to frozen conflicts. It’s a remarkable track record; the sultanate played a vital role in US-Iran contacts that led to the 2015 nuclear accord, and the UN has recently acknowledged Oman’s critical contribution to efforts to end the Yemeni civil war. But it would be premature to assume that this convergence of interest between Israel’s nearly triumphant expansion of ties to Arab states and Oman’s readiness to help reduce regional tensions will lead to a breakthrough on Iran. In the absence of any detailed readout of the meetings in Muscat, one can only speculate on its longer-term implications. It is quite unlikely that Israel is looking for a dramatic shift in dynamics with Iran. Netanyahu has built a strategy for solidarity with Arab powers based on shared perceptions of the threat posed by Iran, not only from its nuclear activities, but its entire regional presence and ambitions. Israel sees this as pretty close to an existential threat, given the embedded Iranian presence in Syria and its partnership with Lebanese Hezbollah. At best, Israel might see Oman as useful if the former wants to send or receive messages from Tehran. Even in an environment of enduring mistrust, either or both parties may seek indirect contact to avoid miscalculation or to set redlines about Syrian airspace, for example. Israel probably has other channels to communicate with Tehran, but coordinating with the Arab world about signals to Iran may have other benefits in today’s circumstances. Oman may have simply offered to play a role, if desired, rather than pressing the Israelis for any particular course of action. Press accounts, in fact, point to the peace process with the Palestinians as the main topic of conversation. 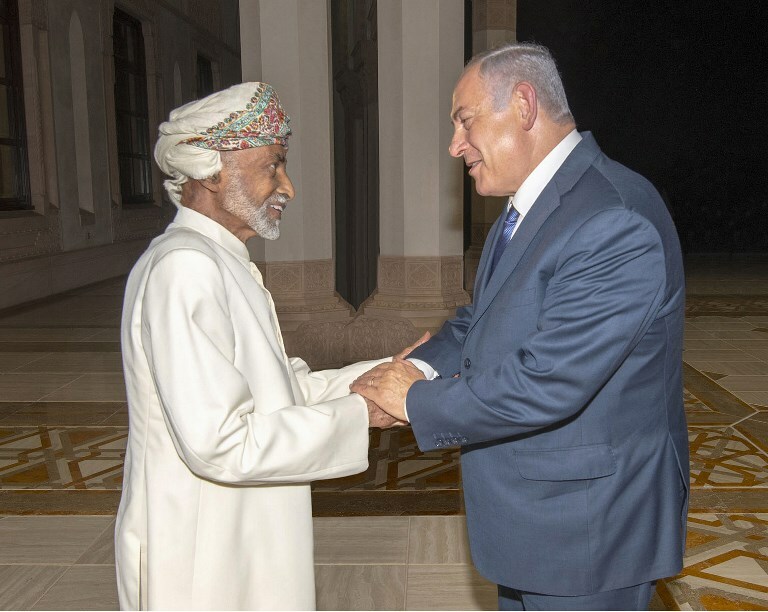 While Netanyahu and his political base seem dismissive of the need to make any real compromises, Oman’s efforts are another reminder that one should not rule out the courage of the wily Sultan and his track record for peacemaking. A breakthrough on that front would make this surprise visit of more lasting consequence. Ellen Laipson is director of the international security program at the Schar School of Policy and Government at George Mason University in Virginia. She is a former president and CEO of the Stimson Center in Washington, which followed a quarter century of work in government service. Her last post in government was vice chair of the National Intelligence Council.